AGM and gel batteries are often considered to be one and the same. This is because they have a similar core of attributes. Both are nonspillable. Both offer deep cycles and they can both be mounted anywhere, so they're flexible. But the differences between them, make them. AGM batteries offer a plethora of unique attributes that make them the clear and far away favorite. The fact that AGM offers more than gel batteries is not new. AGM models outsell gel batteries at about 100 to 1. The main reason for this is due to the cost difference. AGM is less expensive than gel batteries. AGM batteries also offer a lot of useful qualities that make them the one to pick. AGM batteries are high quality and work at optimal capacity at a large range of temperatures. They work great for all high amp needs and have a very slow self-discharge rate (meaning you can leave one plugged in and you won't waste a lot of energy). The thick AGM separator absorbs and holds acid to prevent spilling. And the precision assembly creates a uniform book of plates that are tightly compressed in each cell and held under pressure in the rigid battery case. The result? A battery that resists vibration, recharges faster, cycles more and last longer in demanding applications. Also, AGM batteries charge very easily and hold their charge very well. Gel batteries are very delicate things; one mistake in charging them will ruin the battery completely, even if it is new. Because they're delicate, and cost more, gel batteries are not a first choice for most applications. Gel batteries are called gel because they use silica (or sand) to turn the acid inside the battery into a thick liquid. This liquid does make it spill-proof, like our AGM batteries, but the gel is fragile, and can be easily burned if used in high amperage situations. Things like quick charging, high discharge, or other intense situations are all likely to cause serious damage to a gel battery, making it fail even if it's barely used. AGM batteries use the concept of gel batteries and take it a step further. This makes for a product with the same resistances and the same sealed and spill-proof case as a gel, but now offers the flexibility and high performance that only comes from an AGM battery. Combine this with a streamlined way to produce the batteries and you have a more affordable and powerful tool that is a must have for anyone looking for a quality product they can trust. 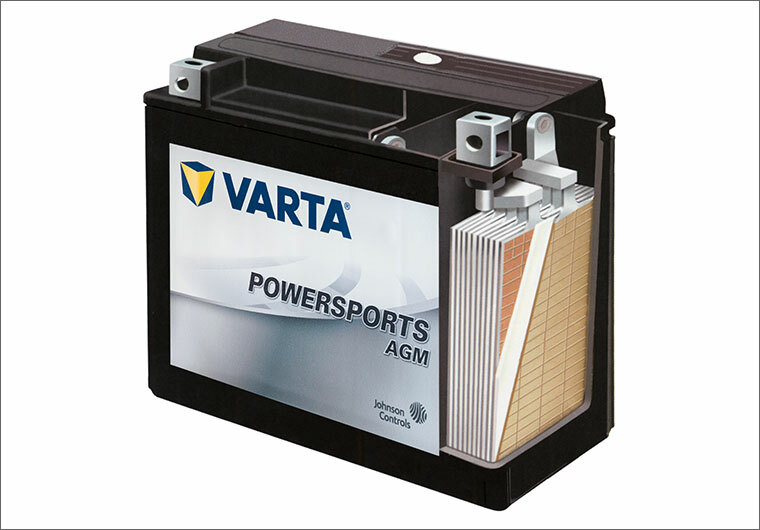 Click here to check out VARTA Powersports batteries!